PAY ONLY $49.00 US TOTAL! By clicking PAY, I have read and agree to the above Terms & Conditions. Direct CabCall provides drivers and passengers the only Taxi Cab and Fleet Services app that services everyone worldwide. Our patent pending Automatic Activation gets you service provided there is at least one driver and one passenger locally logged-in anywhere on Earth. For worldwide service passengers can use Direct CabCall UNIVERSAL. When travelling, step off your airplane, tap the green Service Light, and your cab is on its way "in ten seconds or less." Or, use a Private Label custom app "Powered by Direct CabCall" that serves only local drivers and passengers. Direct CabCall is the premier patent pending taxi cab app that provides great FREE service worldwide! But it's up to you to make it happen in your local area! "Get Your Local Area Hooked-Up!" Get your passengers signed up by going to "Profile Settings (Explore screen, tool tab,upper left) and "Send Invitation," then select "Confirm." Also, Please, review: How, What, Where & Why> New Driver - Quick Tips. No dispatcher, No calling, no waiting on hold, direct from passenger to driver! Remember taxi cab apps only work when both drivers and passengers are logged on. So, send out invitations to your passengers and friends, and STAY LOGGED ON! Your business will pick up as more passengers see that you are always reliable and available. You may sign-up or log into your account on this website or by using your downloaded Direct CabCall app. Also, you will find most of the answers to your questions on our website and by checking TaxiCab Drivers or FAQ tabs. If you have any additional questions, comments, etc. email us at: directcabcall@gmail.com. Our website is currently undergoing construction & our App is being upgraded to include "Fleet Services" for taxi cab companies. To CREATE AND MANAGE YOUR OWN FLEET OF DRIVERS TO SERVICE YOUR POPULATION OF PASSENGERS. Just create your Fleet Service account and provide your Fleet Account Number to your drivers so they can then register. Our next app update will include "Yelp My Destination" that will allow passengers to use Yelp to set their destination and then order a taxi cab with one tap of our Service Button. Coming Soon: P2P (peer-to-peer), passenger to driver Fare Payment and Driver Certifications: Allows passengers to verify company and ID of drivers. Note: All drivers are Independent Contractors (see: Terms & Conditions), Note: Always display your company name, ID or medallion, phone number and a properly marked vehicle. The updated app will be provided in the App Stores as soon as possible. Thank you for your feedback and patience as we work to provide these new services. How Do I Get Direct CabCall Universal for Free? Just download, signup, and go! 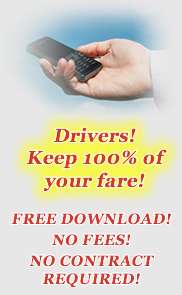 Keep 100% of your fare and tips! It's your money! 1. Simply download and install Direct CabCall onto your cellphone. Note: Requires Android 2.3 and up. Is not configured for tablets. 2. SIGN-UP: Use this website or the downloaded Direct CabCall application to sign up. 3. Log into your application. 4. At the Explore screen, if at least one (1) passenger is logged-on in your local area, Completely registered accounts have a green Service Button. If no passenger is logged-on in your local area your Service Button will be red. The green Service Button is Automatic Local Activation and will activate if passengers are within about 35 miles of your cellphone location. So, download your application from anywhere, if there are Direct CabCall passengers in your area your service is immediately activated and indicated by a green Service Button. If there are no Direct CabCall passengers in your area go to your Direct CabCall app Profile Settings (tool icon, upper left), then select Send Invitation. This will pull up your phone contacts and you may select which individuals to send a Direct CabCall invitation. * A small (about .75 cents) booking fee may apply after 6-12 months free usage. Direct CabCall is provided free of charge. All drivers will receive service free of any charges whatsoever for a minimum of 6 months to 1 year. Afterwards, fees may apply at .75 cents per passenger accepted. We will never take any part of your fare or tips! No passengers are Registered and Logged-on in your local area. If there are no Direct CabCall passengers in your area go to your Profile Settings (tool icon, upper left), then select Send Invitation. This will pull up your phone contacts and you may select which individuals to send a pre-written invitation. Fully Registered- Indicates Passengers are available (logged-on): Unlimited usage. What Does The Direct CabCall App Cost? You keep 100% of your fare and tip - that's right, 100%. *Note: Always uninstall previous version before installing new version. Special additional Features & Services, if selected – fees may apply. No hidden fees or charges. Receipts are automatically sent to your email address and updated on your myAccount. Cancel at any time. "Driver's License I.D. Number": The purpose of this entry is to help passengers identify you as legitimate and lawful taxi cab driver. When registering you may enter your driver's license or plate number. You may also enter your Hack or medallion I.D. If you choose not to do so, you may enter random numbers. Please, be aware that passengers receive this information and may reject your booking or refuse to enter your taxi cab if the ID numbers cannot be verified. If requested during or after booking always provide your passenger with your company name and number. Tip 1: “Driver’s License I.D. Number” – You may use your Hack I.D. Number, License Plate Number, or any identifying number that your passenger can recognize. You can also enter your company phone number. Every time I try to log-in my app crashes! Tip 2: This most likely means you are using an incorrect email address or password. First try using "Forgotten Password." If that fails, create a different account with a different email address, but this time make sure your email address is correct and write down your password and remember upper & lower case and all characters. Note: Your welcome notification and all subsequent Direct CabCall email will go to your new email address. Tip 3: This means you have service in your local area, but no passengers logged on. After logging-in: Go to “Explore” screen, then use tool tab (upper left) to get to “Profile Settings.” Select "Send Invitation" to notify your passenger contacts! Tip 4: Direct CabCall Universal Service is provided to you Free of Charge! KEEP 100% OF YOUR FARE & TIP - IT'S YOURS, KEEP IT! Most taxi cab apps take some portion of your fare and/or tips.- some as much as 50%. The more passengers you and other drivers in your area get signed-up, the more business you all will have. Tip 5: When a passenger requests a taxi cab you should receive a "green light" notification, a square box will light-up (green) on your Explore Screen. It will either be Auto-Booked to one Driver (you) and you should then select from your Explore Screen “Booked Passenger,” or it will E-Hail to all drivers. If E-Hailed to all drivers you will receive a green light notification telling you to select “Map View.” This will bring you to the map screen where you may select the passenger by the icon on the map screen. If you are the first driver to accept the passenger you will receive the booking, if you attempt to book afterwards you will receive a notification, "A bid is already processing." I Can’t See The Passengers Icons On My Map Screen – HELP! If you have received a notice, but the map screen is not displaying a passenger icon that means your service provider or data is not processing as quickly as our cloud service. However, the order is still available to you! From your Map Screen select the “Clipboard” icon on the upper right. You can then Accept the order from there. SHOW PASSENGERS HOW TO LOCATE YOU! Tip 7: The Direct CabCall App provides you and your passengers with premier state-of-the-art technology, but it is up to you to build your business! Send your passengers invitations or call them and be sure to have all passengers mark you as their “Favorite Driver!” While working - Always keep your app logged-in! You will receive your favorite passengers and those of drivers who are logged-off for the day. Passengers may not see your icon on their map screen or be able to book your request if your Preferences do not match the passenger's preferences, or if your TaxiStand Radius is too small. To set your Preferences go to tool tab (upper left), select "Set Passenger Preferences" then select "Reset to Default." This will assure that every passenger will see your icon. WHEN POSSIBLE ALWAYS "RESET TO DEFAULT." Also, setting your TaxiStand Radius to maximum blocks or miles will assure the widest possible passenger contacts. How Do I Post My Company Name & Logo For Passengers? Post Company Name: From your app go to Explore Screen>Tool Tab (upper left)>Profile Settings>Edit. Then at "First Name" enter your company name. At "Last Name" enter your name. Select "Save." Note: If not your registered name, each time you return to Edit Profile you may have to re-enter and save your company name. Display Company Logo: You may display your company logo by using your logo as your picture. Note: You may have to crop your logo to fit to a proper display. Now your passengers will see your company name and logo displayed along with your name when they are selecting a driver and when their order is booked. After signing-up your passenger, keep them as your passenger! Have your passengers mark you as their "Favorite Driver" by having passengers select "History" then select a previous booking. At "Trip History Details" passengers put a check mark next to "Favorite." Now when using "Select & Send 1 Driver Now" passengers will be able to find you as their Favorite Driver by tapping on the Star with "Favorite Driver." Can I Use Direct CabCall Service If I Already Have A Dispatcher? Yes. Direct CabCall is a service for all Taxi Cab drivers who are independent Contractors. It does not replace your current dispatch system. It is designed to provide the Independent Contractor with a primary source of passengers, in addition to your current dispatch service. However, even if you change companies your Direct CabCall service continues uninterrupted because your service is also independent of taxi cab companies, and remains your private and personalized dispatch service. Auto Book - "ON" or "OFF"
AUTO BOOK "ON": Auto Book is located on your Explore screen. When turned "ON" you will receive the next passenger request nearest to your current GPS location. This process is fast, very fast! From the passenger's request to your completed booking takes about 1.5 to 3 seconds for you to receive "Status Booked" including complete Bid Offer Details. You will receive a notice saying, "A new passenger has Auto-Booked," Your "View Active Passenger Detail" tab will display a green notification, select to see the completed order. AUTO BOOK "OFF": If you have Auto-Book turned "Off" your Bid Offers will come in as usual. When a green notification is displayed select the "View Available Passengers," then select a passenger from your map screen. You will receive a notification of all requests. To view Details of any completed order, select "View Active Passenger Detail" tab. NOTE: When using Auto Book the passenger is not able to view a Glympse™ of the order because you are not able to send authorization when Auto-Book is turned "ON." When selecting a passenger from View Available Passengers map screen, Direct CabCall will provide every driver with a nearby pick-up address as a “Bid Offer.” After you accept a Bid Offer only you (a single driver) will receive the full address, data, and profile of your passenger. It’s your business and you deserve choices. 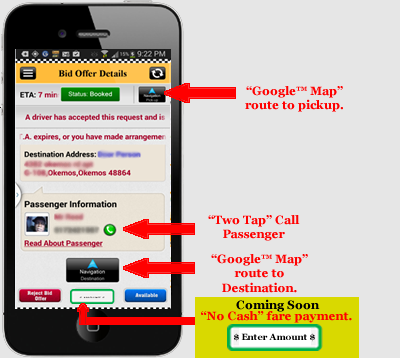 You select your fares by View Available Passengers & Bid Offers or by Auto Book and will receive all available information on your passenger, including picture if downloaded, before accepting a fare. You will be able to cancel the fare at any time, and THERE IS NO FEE FOR CANCELLING ANY ORDER, even after accepting the Bid Offer. Also, if a passenger has not made a request but is logged on, you may check View Available Passengers then Bid Offers to call the passenger in advance, even before they request a taxi cab. NOTICE: Be sure to immediately identify yourself as a Direct Cabcall driver, the company your work for, your full name, account number, and face card number or car tag number. Let the passenger know that you are calling because you see they are still logged on. Be professional, courteous, and polite. You may set a passenger pick-up radius around your taxicab. Direct CabCall uses the GPS signal on your cellphone as a central hub from which you may set a pick-up radius of passengers. You set the distance you are willing to travel for a pick-up and only those passengers will appear within your map screen TaxiStand Service Radius when you select View Available Passengers. Map view color-coded passenger icons showing the real-time GPS location and availability of every Direct CabCall passenger in your area. Plus, Google Navigation route display providing direction to your pick-up or destination address for every booked passenger request. You must be logged-in to your Direct CabCall app to View Available Passenger requests or to accept passenger requests. To go "On Call" or exit Direct CabCall app without logging out, go to "Explore" screen. Using your cellphone back function you will receive: Are you sure you want to exit DCC? Selecting "Yes" will keep the app running in the background and you will be able to access the screens on your cell phone. You will also remain visible to Available Passengers. Tapping the DCC icon will bring up the Direct CabCall "Explore" screen. What is a “Bid Offer” And How Does It Work? A “Bid Offer” is what allows you the driver to select your own fares and passengers instead of being sent blindly to a pick-up address. The initial offer goes out to all qualified and available drivers but includes only the nearest cross streets (within approximately 1/4 mile or several city blocks) and general information. Only the first qualified driver to accept the Bid Offer is then sent the full address and profile information of the passenger. This is the only driver who will receive the full address and profile information of the passenger. The driver may “Reject Bid Offer" at any time, even after receiving the full address and profile of the passenger. Receive E.t.a., pick up and destination address with "Easy Tap" Google navigation, picture and name of passenger, a direct call feature to passenger, plus private and forum notes, cancel an order at any time. When you have traveled 50% of the way to your current passenger you automatically become "Available" to book your next fare. 2. After your order has been Booked select View Active Passenger Detail. At the Bid Offer Details screen tap on the green phone icon. 3. Also, if a passenger has not made a request but is logged on, you may check View Available Passengers then Bid Offers to call the passenger in advance, even before they request a taxi cab. NOTICE: When calling a passenger always immediately identify yourself as a Direct Cabcall driver, the company you work for, your full name, account number, and face card number or car tag number. Let the passenger know that you are calling because you see they are still logged on. Be professional, courteous, and polite. Estimated Time of Arrival is displayed. "Available": After you have accepted an order and you are at Status:Booked your "Available" tab will automatically enable by automatically changing from grey to blue. This occurs when you are 50% of the way toward your current pick up. Available enabled will allow you to conveniently book your second passenger in advance, and is very useful if your next passenger is in the location of your next drop off. Note: It is advised that you notify your current passenger that is waiting for a pick up before selecting "Available." If you need to recall any passenger's information, from your Explore screen select "History" tab. Cancel your fare at any time. Direct CabCall takes your privacy very seriously! Your location is only temporarily accessed for the purpose of directing you to your location. It is never shared or accessed by Direct CabCall. Glympse™: A third-party service that allows passengers to temporarily view your details and map location as you are approaching the pick up location. The "glympse" provided by Direct CabCall is automatically terminated 5 minutes after the e.t.a. expires, and the passenger is no longer able to view your Glympse details or location. The glympse to the passenger is not provided when a request has been Auto Booked. YOUR NAME: The name that you display to your passenger should match the name on your Hack License & Driver's License. YOUR CELLPHONE NUMBER: The number that you display to your passenger should be the number that you use for operating your Direct CabCall Application & your business. Any number that you display will be the call back number provided to your passengers. Passengers may refuse service if they .can not contact you by the provided cellphone number on their Status:Booked. YOUR PICTURE: The picture that you display should be your actual picture. Passengers may refuse service if they approach your taxicab and can not properly identify you. To edit any of the above features go to Explore screen, then Tool Tab (upper left). Select "EDIT." Note: When passengers view your name, number, or picture on a request it may positively or negatively affect your ability to get a passenger. HISTORY: Your Trip History is only stored in your History tab for your private use and when deleted by you it cannot be retrieved by you or Direct CabCall. GPS: Turn on or off GPS at any time by simply going to your Profile page. Does not effect 911 emergency services. Direct CabCall does not retain or store this information, nor can Direct CabCall retrieve this information when the order is completed or deleted by the user. Please, keep in mind that you are a true Independent Contractor. Direct CabCall only provides you with a platform to help conduct and improve your business. How you present yourself and your business will affect your business. So, please be respectful, courteous, and truthful in your dealings with the passengers and the public. To add comments go to "Explore" Screen and select "History," then tap your previous trip history. You may add public comments on the "Driver's Forum" or your private comments on "Private Notes." Only you will be able to access or see your private notes reference this passenger. Direct CabCall provides the Driver's Public Forum as a free speech zone primarily for the purpose of your health & safety. Please, be professional, prudent and respectful when posting to the Driver's Forum. See: Terms and Conditions: 9. Content Submitted or Made Available for Inclusion on Direct CabCall.com. NOTE: When passengers use "Favorite Driver" or "Select & Send 1 Driver Now" only you will receive the sound or text notification. However, other driver will still be able to view & select the passenger from their map screen. So, don't delay. Set up your credit card or payment method online. You will receive automatic and verifiable payment to your account at the time each passenger makes payment. Void where prohibited. To manage your myAccount log in from any website page (above upper right). Provided by Direct CabCall. Using your Direct CabCall app Tools icon (upper left) select "Set Driver Preferences." There are various preference settings including van or car, handicapped van, non-smoking, grocery stores, baggage, multiple stops, and yes, bars. Selecting preferences will match your preferences to that of passengers. Not able to book under your Preferences? "Reset to Default" to obtain the largest possible passenger selection. Provided by Direct CabCall. Maintain Private & Forum notes about previous passengers, "The Good, The Bad, and the Ugly" that you may access when your booking is complete by tapping "Read About Passenger," or by logging into your myAccount online and selecting History. Provided by Direct CabCall. Upload your picture to show passengers your friendly face! You may do this by using your app: Go to Tools icon, upper left, select Edit then Browse. You may also upload your picture to your Direct CabCall app by going online to myAccount. COMING SOON! Driver verification by documents, registration, insurance, etc. available at myAccount - optional. Set up your payment method and receive payment without using cash. You calculate the fare or metered rate, input the amount, then receive payment directly from your passenger to your account. Void where prohibited. Small transaction fees may apply.